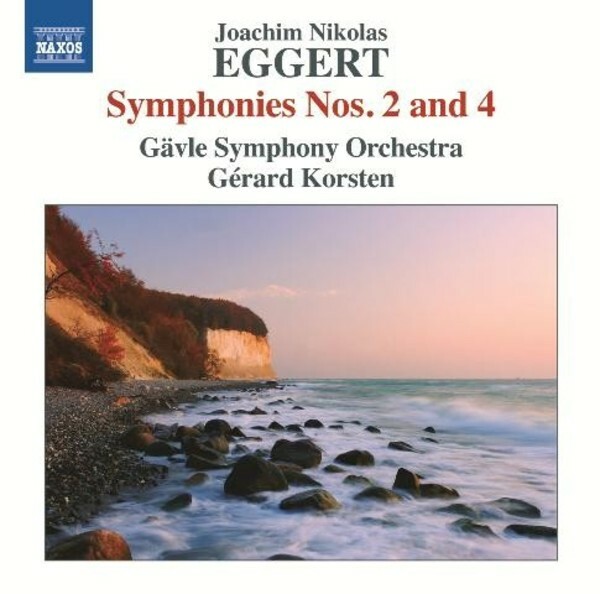 One of the more forward-looking Swedish composers and conductors of his age, Joachim Nikolas Eggert died before achieving wider European recognition and has remained neglected ever since. The Second Symphony evokes moods both stormy and lyrical, revealing a technical brilliance that foreshadows Schubert. The Fourth Symphony reflects the military backdrop to the political unrest of the times, its alternative slow movement being one of Eggert�s most powerful and progressive works. Symphonies Nos 1 and 3 can be heard on Naxos 8572457. Born in South Africa, G�rard Korsten began his career as a violinist, after studying with Ivan Galamian at the Curtis Institute and with S�ndor V�gh in Salzburg. In 2005 he was appointed Principal Conductor of the Symphonieorchester Vorarlberg, Bregenz. His past engagements include concerts with the Budapest Festival, Leipzig Gewandhaus, BBC Scottish Symphony, Swedish Radio Symphony and G�vle Symphony Orchestra, and he has appeared at many notable opera houses, including La Scala Milan, Royal Swedish Opera and English National Opera. Featured among G�rard Korstenʼs many recordings are Tchaikovskyʼs 'Serenade' and 'Souvenir de Florence' with the Chamber Orchestra of Europe on Deutsche Grammophon and a DVD of 'Le nozze di Figaro' at La Scala Milan, which was awarded a Diapason dʼOr and was Criticʼs Choice in Opera News.